Debutant Australian Grand Prix winners Brawn GP are making more than a third of their staff redundant to cut costs. Hours after Jenson Button and Rubens Barrichello completed a dream one-two finish in Melbourne, chief executive Nick Fry announced the losses. "It's very unfortunate that we've got to do that but it's the change of technical regulations and obviously we are now a private team," he said. About 270 jobs will be lost from the team's Brackley factory in England. Brawn GP were created in the wake of Honda's withdrawal from Formula 1. 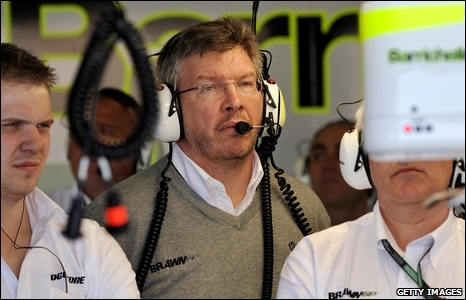 Team boss Ross Brawn sealed their survival with a management buyout in early March, ensuring most employees initially stayed to help rebuild a fresh team after the under-performing Japanese outfit pulled out of the sport because of the global financial crisis. Since that point Brawn have been a revelation, consistently going quickest in pre-season testing before making the most successful Grand Prix debut by a team for 55 years in Melbourne on Sunday. But Honda's estimated 2008 spend in F1 was at least £210m and Brawn GP, who announced Richard Branson's Virgin Group as their first significant sponsor on Saturday, are now operating on a far smaller budget. "It's about 270 [job losses]," said Fry. "We are about 700 people at the moment and we talked to the staff about going down to about 430, something like that, which is where we [predecessors BAR] were in 2004." Max Mosley, president of motorsport's governing body the FIA, has repeatedly stressed the need for F1 teams to trim their workforce. Additionally, F1's rules have changed this season - meaning fewer staff are needed now that testing is banned from the start of the season to the end of the year. Brawn are also now buying in their engine from McLaren's partners Mercedes. Fry revealed that staff at Brawn's Brackley factory in England had been informed and redundancy letters had gone out in mid-March.